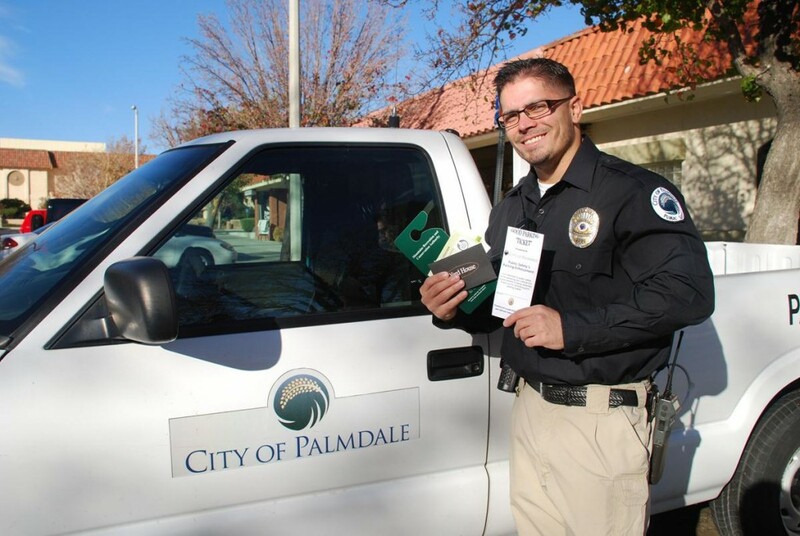 PALMDALE – The City of Palmdale’s Parking Enforcement Division team will issue “Good Parking Tickets” to motorists who display good parking habits now through Dec. 23, city officials announced Wednesday. In addition to the “Good Parking Tickets,” those “cited” will receive a gift donated from one of the city’s local businesses. The gifts range from gift certificates to breakfast vouchers from one of following businesses: Yard House, Dry Town Water Park, Antelope Valley Mall, The Palmdale Playhouse, and the Hilton Garden Inn. Parking Enforcement Officers will continue to patrol the city as part of their usual daily routines. “Remembering to be safe and courteous this holiday season may lead to a parking ticket you’ll want to get!” said Gomez. For more information, contact Neighborhood Services’ Parking Enforcement Office at 661-267-5436. 5 comments for "Palmdale launches third annual “Good Parking Ticket” campaign"
I like this, it’s a way to give back to the community and rewarding good behavior. I’m going to try parking extra carefully so I might get a good ticket. That guy in the picture is really cute! I would love it if it could be used to wave a parking ticket for the day the street sweeper comes by…lol! Only in Parrisville would anyone get a ticket because of the street sweeper, That dog does not hunt in Palmdale.